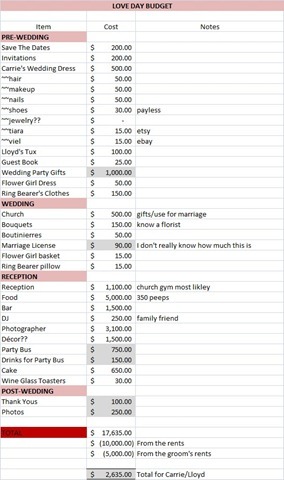 Remember how I promised you that I would give you the details on my wedding budget 2 weeks ago? Well, today I’m going to deliver. If you forgot all about that post, go check it out over here really quick. Budget… We’re on a tentative budget of about $15,000. If we have to throw in a couple extra thousand dollars, that’s okay, but I refuse to pay more than $20,000 for one day. Dress… Someone said good luck finding a dress for $500. I’d love to say I’m getting my dress for free from my good designer friend, but no such luck. In fact, whoever left that comment was completely correct. I went dress shopping on Friday and the cheapest dress I found was $1,100. Epic fail. I haven’t found a dress YET, but I now know that when I do, I’ll probably pay whatever because I’ll be madly in love with it. Damn those crafty designers for making their dresses so dang beautiful. 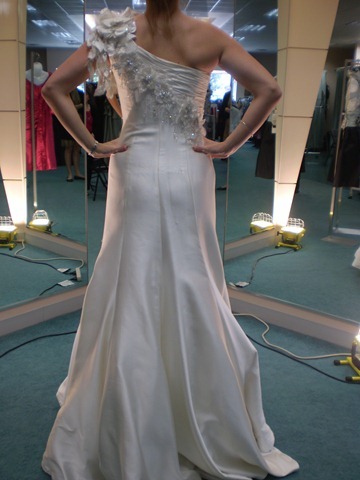 I’m sure “the one” will have me wrapped around it’s little satin train no matter the price tag. In case you didn’t see on twitter, below is the dress that I loved last week. I loved it, but it’s not the one. Close, but no cigar. Save the Dates… Yes, I’m getting them….found a great deal for business magnets on Vista Print (thanks for the tip, Victoria!). I know they’re not necessary. Worse things have happened. Wedding Party Gifts… Let me emphasize that this is a Catholic wedding. We give people titles for everything. We aren’t comfortable leaving anyone out. It’s just how we roll. We’ll be getting gifts for 5 bridesmaids, 5 groomsmen, 3 readers, 1 cantor, 1 priest, 1 flower girl, 2 ring bearers, 3-4 alter boys, among others. I also would like to note that this doesn’t include the gifts we’ll be getting for our parents which we’re estimating to be about $750 in total. Ring Bearer/Flower Girl Outfits… We’re doing this as a thank you since the parents are also in the wedding. I feel bad making them spend so much on all their outfits. Photographer… Fail. I can’t find one. Wait, I actually found a PERFECT one that we met with last night. She was sweet and excited about photography. But…OH MY GOSH, girl talked our ear off for 90 straight minutes and completely overwhelmed us. We left the meet-and-greet needing a beer and a cigarette and we don’t even smoke. She was way too intense and if she stressed me out in 90 minutes, who knows how she’ll make me feel on my wedding day. I am so disappointed because I really liked her other than that. But, I can’t handle mega-talkers like that. Especially ones that don’t let you get a word in edgewise. Anyways, needless to say, I’m still looking for the perfect photog. Frugal Dreamer, why can’t you live closer?! Invitations… You guys are right. I can’t get them for $200. Probably gonna bump this to $500. Which I am not so stoked about because I always immediately throw invites away, so they are a total waste of cash in my opinion. Ah well, I’ll get over it. Things To Add… Stamp and alterations for my dress! Thanks for those tips and GOOD CALL! 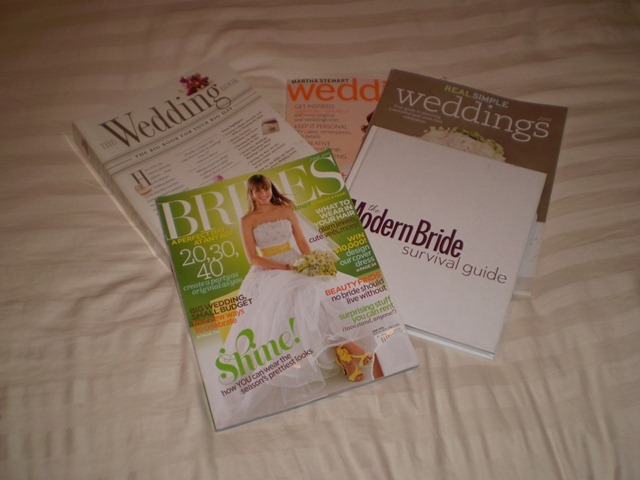 One of my sweet, older co-workers has been fueling my new wedding hobby with magazines, books, and guides. Bless her heart. As I flip through the pages of Brides and Real Simple Weddings, I am thankful that I’m a bit more money-wise than most young brides (not to toot my own horn or anything…but it’s true. Some girls I know would drop hundreds of bones on toilet paper embossed with their future last name if given the chance.). It’s pretty obvious that the wedding industry has turned into this untamed beast that prays on weak brides who are just happy-go-lucky in love. Sure, us brides want a perfect, special, memorable wedding day, but I think things have gotten a little out of hand. In the magazines, there is page after page of advertisements for personalized guest books, engraved cake stands, invitations accented with shades of watermelon pink and seawater green (or any shade your heart could ever desire), silk ring bearer pillows, customized wedding garters, and adorable party favors. I actually asked someone the other day if I could just avoid the ring bearer pillow all together and just have my ring bearer walk the aisle empty-handed. They looked at me in complete shock and said “but where would the rings go?” I mean…do ring bearers actually carry the rings? I really had no idea. I guess I just like watching the confused kids walk sheepishly down the aisle. That’s where the real fun is, right? Yes, okay — I want to be a bride for a day and wear the fabulous costume. But after really listing out all the things I need to buy to pull off the part, it’s pretty overwhelming. When did the wedding industry get so out of control? The industry has become quite good at sucking you in and sweet-talking you into that $250 white gold cake cutter engraved with the date of your wedding day. I think I’ll just use the cake cutter out of my mom’s kitchen drawer that we used for our birthday cakes as kids, thankyouverymuch. Looking at a cake cutter 20 years from now will not make me appreciate my wedding. It will most likely just piss me off that I wasted that $250 because we’ll probably be trying to pay for little Lloyd’s college at that point. In my parents’ wedding photos, things are completely different. My mom wore a baby blue dress that looks nothing like a bridal gown for her wedding. And she seems SO happy in the pictures. I’m guessing she was probably so happy because she was marrying an awesome dude like my dad, not because she was about to eat a heaping slice of sugar out of her $750 cake. I’ve had to remind myself almost daily that all this wedding nonsense is just a bunch of BS. I’m super excited for the big day, but I don’t want to forget the reason I’m here in the first place. It’s so easy to forget that you’re vowing to love one person wholly and completely for the rest of your life instead of just planning some ridiculously expensive party. I’m just trying to keep a healthy balance in the midst of this wedding madness. I know I’ll be much happier in the end if I take a step back from all the tempting extras and just focus on marrying that super hot stud that proposed to me just over 4 weeks ago. Draft Carrie & Lloyd Wedding Budget! Disclaimer: Most of these are estimates…but estimates I’ve researched. I’ve estimated very high in most places. 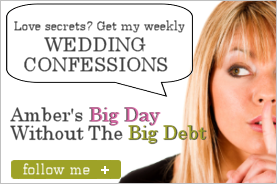 I, Carrie, do hereby solemnly swear not to become a full-fledged Bridezilla blogger. I promise not to focus solely on my upcoming nuptials and forget about all the other little things that this wonderful world has to offer. That being said…I will be blogging about the weddin’. Yep, I’m getting married, we’re having a traditional Catholic wedding complete with a full bar, an huge guest list, and cheesy wedding music. Aw yeah. Church: Booked and SO happy! Money: We’re on a budget of about $15,000 – give or take a few Gs. Guests: I’ve put a limit of 300 on the guest list. (08/05/2010 Update: The guest list has reached 350 and I think we’ll top out at 400…) We made a draft list of 225 that grows slowly every day (we forgot about people, etc.). Our parents haven’t seen it and I expect them each to add a fair share of people. I want to invite EVERYONE I know, but I want to be able to TALK to everyone that day, too. Honeymoon: Lloyd and I are going to splurge on this fo sho. We want to go away for 2 weeks. We’ll probably spend at least 1 of those weeks at an all inclusive resort (I want Sandals…I just have to convince Lloyd) and another week just at different location in the USA. I would love to honeymoon in Europe, but I just don’t see that happening. What’s Next? I have a lot of wedding posts floating around in my head, so I’ll probably be really dishing it out over the next week or so. I’m SO excited! I have found the love of my life and I get to celebrate that wonderful joy in front of all my friends and family! I am so, SO thankful for this. I feel so lucky and only hope every person in the world can feel such joy in their life. Whoa. Sorry. Got deep there. The afternoon flew by and before I knew it, it was almost dinnertime. Lloyd told me that he wanted to go to one of our favorite restaurants downtown – La Bodega – and I happily obliged. (Sidebar: I was sporting some new skinny jeans and flat sandals. Love!). Around the time we started to head out the door, Lloyd told me that I should pack an overnight bag. At this point, I pretty much knew what was going down…. From where we live, it takes a solid 30 minutes to get downtown. So on the ride there, I started to get butterflies. I kept asking Lloyd where we were going and why I needed an overnight bag. He was being all cute and mysterious. I was starving and was about to eat my arm off. I need a mad drink to calm my butterflies. I may have taken #2 a little too far. Oh well…you only get engaged once. The thing about La Bodega is that it’s a Spanish tapas bar. Ah-mazing. If you’ve never had tapas, you need to get some in your life, and fast. Another popular item on the Bodega menu are the pitchers of Sangria. We polished off one two over the course of our 2 hour meal. After dinner, we started to head to a location unknown to me. It turned out to be a fancy hotel in downtown Kansas City. One that we had celebrated our 2 month anniversary at like 3 1/2 years ago. The hotel has all these scenic waterfalls and romantic areas. We had taken pictures in front of the waterfalls for our 2 month anniversary so we did that again…which was cool since it was 3 1/2 years later. Anyways, Lloyd finally led us to our hotel room. 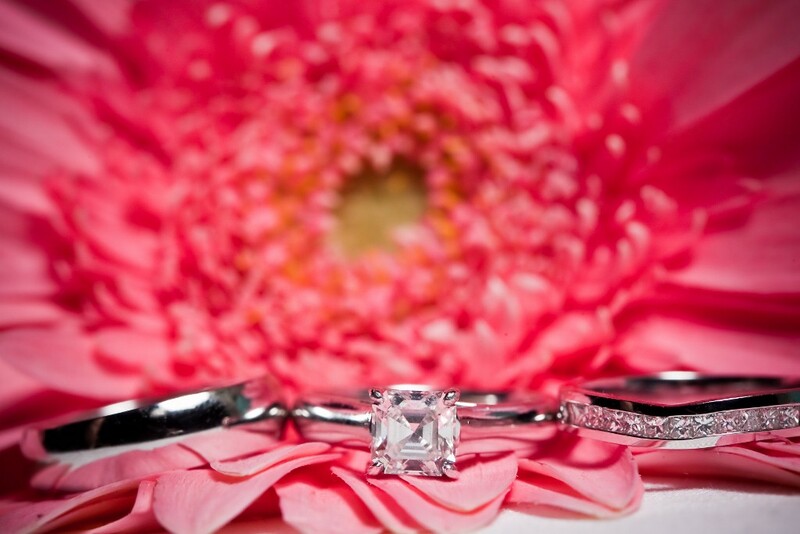 When he opened the door, there were rose petals and vases of roses all over the room. There were my favorite chocolates (caramel & toffee if you’re wondering) and candles (not yet lit – I guess he didn’t want to burn the place down). I was in shock and excited and didn’t really know what to say. So, I did what I always do when this happens. I excused myself to use the bathroom. I also kind of figured that Lloyd needed a couple minutes to do whatever he needed to do anyway. By the time I emerged, he had opened the blinds to reveal floor to ceiling windows that showcased an impressive view of the Kansas City skyline. (I’m a sucker for good views of any city. I think it’s awesome.) We looked at the skyline for a bit and made dumb comments about how pretty it was (I mean we’ve seen the KC skyline a bazillion times). And that’s when things started to go down. Lloyd planted one on me and as he was doing this, I could feel him reaching into his pocket. There must be some genetic switch in women where when they know they’re about to be proposed to, the waterworks come on and they started bawling like a little girl. Because that’s what happened. Lloyd was reaching into his pocket and I started crying. Lloyd started saying all these cute things like ‘you make me so happy’ and ‘I want to spend the rest of my life with you’ and ‘you are a super-duper hottie’ (okay maybe not the last one). And before I knew it, he was on one knee and pulling out a ring! Whoa! I couldn’t believe he actually had a ring in his hand! So he slipped the bling on my hand and we talked and cried and kissed and yada yada yada. It was very private and just the two of us and I couldn’t have asked for anything differently. I found out that his family had helped pick out the ring and that he spent 3 hours at my parents’ house one night asking for permission to marry me. What a stud. So, there you have it. We’re engaged! And I couldn’t be happier. People forcefully saying “We better get an invite!” Wow, really? That makes me want to invite you less. We knew each other for 1 1/2 years before he asked me out. I think one of us was playing hard to get. I was in love with him 6 months before our first date. Ha. I told my BFF that I would marry Lloyd one month before our first date. Lloyd makes me laugh more than any person on the planet. That’s how he got me. If you can make me genuinely laugh, then I like you. We are each others biggest supporters. We decided early on in our relationship that there would be no toxicity or name-calling. We don’t complain about one another to others and we fight fair. It may sound impossible, but it works and it’s great. I get pissed at him sometimes (and him at me, but that’s a lot less often), but I tell him and we move on. I have this thing….where I feel the need to recite every minute detail of my life to someone. Lloyd is so sweet and allows me to do that. I feel better after I do that and he somehow manages to listen to all the boring details. It’s a gift of his. One of my BFF listens to the stuff, too, but Lloyd really get’s the brunt of it. Right before we started dating and during the early stages of our relationship, we used to stay up until 5 or 6am talking and laughing. Wow, the first few months of a relationship are surreal, aren’t they? They are so worth it. I feel so lucky to have ever had something like that. I am so lucky and blessed. Thank you all for your congrats and well wishes. It means the world to me.